I think it might be helpful to hear what some different tire and wheel combos are producing as our new NASA Tire Section Width. If you share the details on your widths I will update this post to consolidate and create a database. I understand it won't be perfect and it will be on the honor system, so consider that before dropping a bunch of coin. DOT tire width is determined by a measurement of the “NASA Section Width” of the largest tire (if staggered sizes) on the vehicle in post-competition impound/inspection, without changes to tire inflation (may be allowed to cool to pre-competition pressure). The tire may be measured while off or on the vehicle at any location not affected by ground contact sidewall deflection. A tire's NASA Section Width is the measurement of the tire's width from its inner sidewall to its outer sidewall using the NASA Section Width tire measurement tool(s) (excluding any protective ribs, decorations or raised letters) at the point 30mm deep to the tread surface on a new tire for vehicles 2400 lbs. or greater, and 23mm deep to the tread surface for vehicles less than 2400 lbs. I will update this post with new measurements as they come in. If there is a measurement already listed similar to yours please contribute your measurements as well. There will likely be some variances like worn shoulders or wheels that don’t run “true” to size...so the more data points the better. This is great idea. Will edit as soon as I figure out how tf to do it. So, I ordered a Neiko 12” digital caliper from Amazon and checked some tires in the garage. I did this really quickly and didn’t check psi...but I figured I could update later. One compromise I made was using my stud finder as a “spacer” to reduce the caliper “tongs” measurement to about 3cm. I’m considering cutting the “tongs” to exactly 3cm to be more exact with the measurement. Anyway, here are some preliminary findings and measurements. I wil round up on millimeters. Both the 225/45/17 and 235/40/17 Maxxis RC1 on an identical Borbet 17x8” Wheel are just about the same 229mm wide. 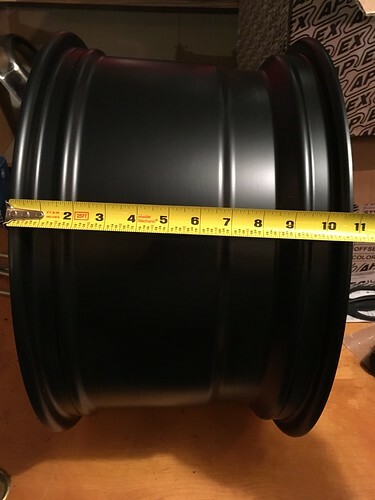 17x8" Borbet rim it comes in right at or maybe under the 226mm threshold at 23mm (could be a cheater tire for the sub 2400lb cars?)... might be fine as is on 8" wide but it is close for sure... on a 7.5" wide rim I am just about sure it will be well under the 226mm. Unmounted this is over 226mm at 3cm, but under 226mm at 23mm. Honestly, it looks like tires with a much more “squared” shoulder will have a nice advantage in the way these are measured 3cm down the sidewall. Rounded shoulders give up quite a bit of contact patch on each side. Also, it looks like the wheel width will be a significant variable on how wide or narrow a tire will run. 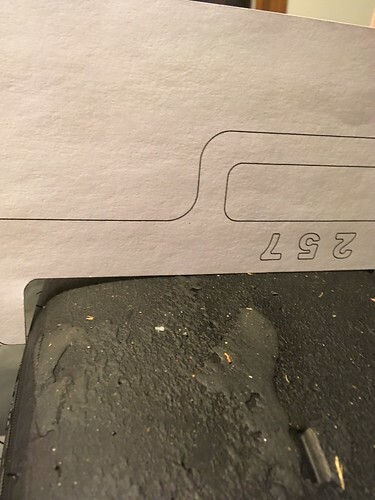 I measured the 225 RE71 on a 7.5” wide tire at 211mm at 30mm deep but at 23mm deep it would be even narrower...so well within the 226mm Section Width limit for sub 2400lb cars. I was wondering if the Hoosier 245’s would still be under 266mm on a larger than 9” rim. Since 9.5” wide rims still aren’t at the limit, I hope someone measures a 245 on 10” rim. Looks like the NASA MA folks have been busy checking tires... Thank you very much to the people that contributed. Anyway..these are from the Facebook page.. I figured I'd add them here. Hoosier R7 225/40/17 on 9.5" rims makes the 257MM template with room to spare. Anyone do some tire measuring in the last couple weeks? Or is there another forum or Facebook group that has posted any more widths or other sizes? The pictures don't seem to work. Can you please re-share or re-link them? Or, say which passed and which didn't? Thanks! I can't see them on my iPhone but I can see them on my laptop... maybe I need to upload them to something other than dropbox. Can you see this image? 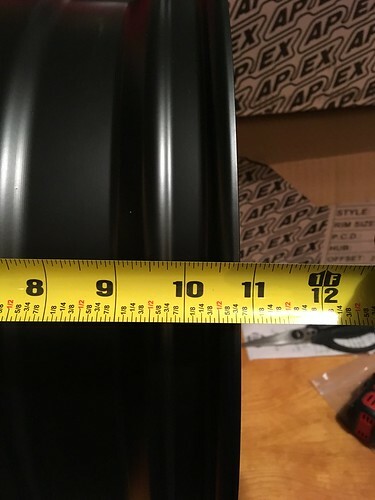 Bummer that the 245/40/17 Hoosiers are over the 266mm template on a 17x10. Darn. Thanks for making a spreadsheet. Interesting that a 245/40/17 A7 fits the 266 on a 10" but the same size R7 does not. My theory is that the apex rims run wider than most. NO GO on the 266mm/30mm (by about 1-2mm)! I definitely wonder as above if this wheel is just bigger than other 9.5's? I have these tires on other 9" wheels and other 8.5's, and they are compliant by 2-5mm. So, the new system will not only catch tires that are not as advertised, but wheels that are larger than listed as well....definitely evening out the playing field for all. We did a measurement on our ST3/E0 E36 18x10 Apex ARC 8 & EC-7 wheels and 255/35/18 Hoosier R7. It did not appear to fit the 282mm template, but just barely missed, by maybe 1mm, that is a pretty tight tolerance. Is 1mm of section width really that much of an advantage? I know going back into the PT classing history journals, the 255 has always been the "cheater size". But this is ST...not PT? The primary reason for using this size for us was actually the height of the tire. Similar tread width (if not the same) between the 275/18 and 255/18, the 255/18 has a little more rounded shoulder than the 275/18 I believe (I don't honestly know which is better? square vs. rounded?). The 275/18 tire, however, is much taller (25.5" vs. 24.8"), which means you have to raise your ride height and now your cg. This is a real headache trying to find a tire wider than the 245 on a 9” rim to run on a e36 (for tt contingency). Yes there are wider options, but they are all really tall. Meaning, really hard to fit and huge gearing reduction. Any chance of ammending the 282mm to say 286 or something? Our testing of the 275/17 and 18 Hoosier on a 10" wheel had no problem fitting the 282mm tool. Has anyone measured 245/40/15 Hoosier on a 10" wheel with the 266mm template? I am suspecting that it will be very close as it runs narrower than both the 245/40/17 and 245/40/18 Hoosiers with the 17" being the largest. The 18" Hoosier seems to have cleared on 9.5" Arc wheels which might run large for the given size so could almost be 10" wheels. I'm going to test out the 9" Arc-8 with the 245/40 x17 R7 in the next few days. I've got my fingers crossed--should be okay--just missed on the 9.5" by 1-2mm. Any update to testing the 245/40/17 R7 on a 17x9? I tested the 9" Arc-8 with the 245/40 x17 R7 with a date code of 2317, and it fit the 266mm tool by less than 1mm at 35 psi. I purchased both a 245/40/18 and 245/35/18 Hoosier R7 and neither of them would clear the 266 template dismounted. Not sure how someone got this to work on a rim with pressure??? It seems it will depend on the wheel width. What size wheel were you planning to run with? Here was an example for me..
Also, if anyone with measurements would please post your results here I will compile the new data added in the last couple months and update the spreadsheet accordingly. Thanks in advance.